CHAMBLEE, Ga. -- Trying to stave off a major upset ahead of the 2018 midterm elections, two of President Donald Trump's Cabinet officers returned to Atlanta's traditionally conservative suburbs and urged Republican voters to maintain the GOP's monopoly control in Washington. Agriculture Secretary Sonny Perdue, a former two-term Georgia governor, took sharp aim at Republican Karen Handel's opponent in Tuesday's congressional runoff election, 30-year-old Democrat Jon Ossoff, who has raised more than $23 million from people around the country hoping for a victory that could turn the tide on Trump. "The leftists have gone and typecast and they've picked this young man -- charismatic, articulate -- and they've taught him a few Republican buzzwords," Perdue said. "They think he can fool you. It's not gonna happen." But it very well may, with polls showing a tossup in Georgia's 6th Congressional District, where Republicans usually coast. Ossoff brought some political celebrity firepower of his own, campaigning Saturday with civil rights icon John Lewis, the Atlanta congressman from the neighboring 5th district. "Let's honor him ... and who all who sacrificed with him" by casting a ballot, Ossoff told his supporters at one stop. Lewis called Ossoff "smart" and "good," before embracing the young candidate who was born barely a month after Lewis was sworn in as a congressman. Lewis, whose criticism of Trump has drawn Twitter jabs from the president, did not mention the administration. The candidates' choices on the final weekend of campaigning reflect their expectations of a razor-thin margin that will turn as much on core partisans as on persuading moderates and independents. The results will be seen as a measure of how voters feel about Republican leadership months into the Trump presidency. Trump barely won this well-educated, affluent district in November, despite previous Republican nominees here eclipsing 60 percent. Perdue defended Trump as "a true populist," but acknowledged that even "some Republicans" are "turned off" by the president. Health Secretary Tom Price, whose resignation to join Trump's Cabinet prompted this special election, urged voters to have a "crazy turnout" on Handel's behalf. He reminded his former constituents of the district's GOP pedigree, electing eventual Speaker Newt Gingrich and future U.S. Sen. Johnny Isakson before sending Price to Washington for 12 years. Handel made a similar appeal to honor the district's "legacy." She said voters "know me" from stints as secretary of state and commission chairman of Georgia's most populous county. 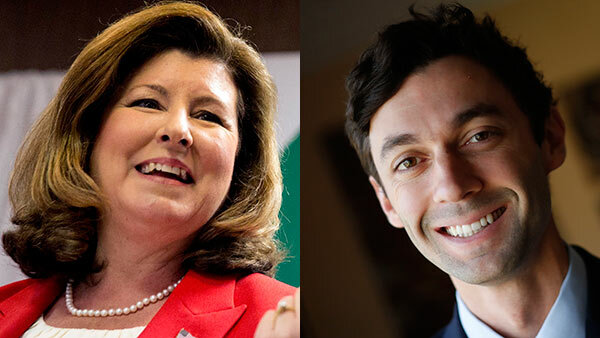 Ossoff and Handel insist their matchup - recognized as the most expensive House race in U.S. history because of money from outside the district - is not about or the dynamics on Capitol Hill. But Perdue flatly disputed them, calling the election "a harbinger of national politics" as Handel looked on. Democrats and liberal activists nationally hope to show they can flip the 24 GOP-held seats they would need to reclaim a House majority next November. They argue Ossoff's near-win in the first round already bodes well for Democrats running in other suburban districts where Republicans don't start with such a fundamental advantage. There are 23 GOP-held House districts around the country where Trump actually lost to Hillary Clinton. Handel has raised more than $5 million, less than a quarter of Ossoff's total, but national political action and campaign committees aligned with both parties have spent big as well: $7 million from a PAC backed by House Speaker Paul Ryan; about $4.5 million from Republicans' House campaign arm, and another $6 million from the Democrats' House campaign committee. Ossoff's television ads target swing voters and disaffected Republicans, promising an "independent voice" and lambasting "wasteful spending" by "both parties in Washington." But his day-to-day campaign operation has focused more on the Democrats' main coalition: young voters, nonwhites and women. Ossoff also has sought to make health care a defining issue, even before Price's return to the district. The Democrat says House Republicans' health care bill punishes working-class households that gained coverage under the Affordable Care Act, and would "gut" consumer protections for individuals with previous maladies in their medical history. Handel says the Senate can make improvements, but she'd have voted for the House-passed version. She rejects the Congressional Budget Office estimate that 23 million Americans could lose coverage under Republicans' plan, and she insists the bill protects those with pre-existing conditions. The bill declares that insurers cannot deny coverage based on patient history - a point central to Handel's claims. But the proposal also would allow states to obtain waivers that would jettison existing prohibitions on charging more for patients based on individual history and risk. Ossoff says removing that cost protection makes any coverage guarantee "useless," because policies would become unaffordable, particularly given the Republicans' proposal to roll back premium subsidies that are a primary feature of the 2010 law.